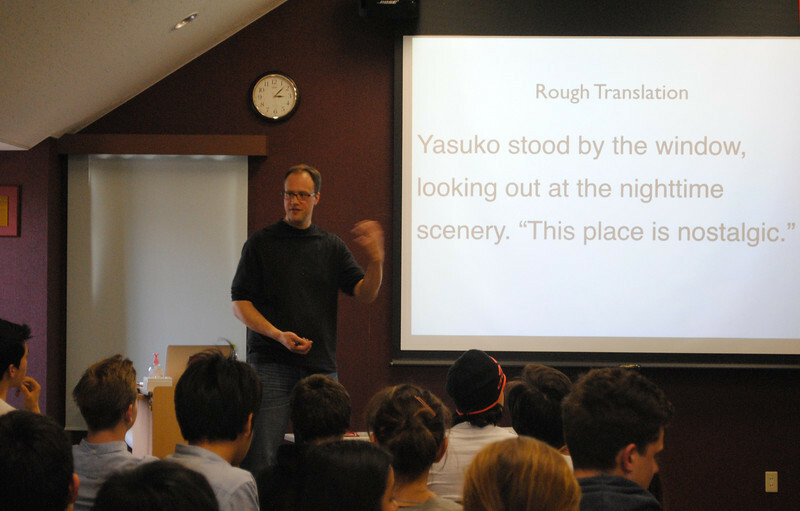 On Wednesday, March 12th, our school (Yokohama International School) was lucky enough to have a visit from Japanese-to-English translator Alexander O. Smith. Alex has been working in translation for 15 years, translating everything from video games and manga to novels and song lyrics. His presentation was lively and engaging, providing the students with plenty of concrete (and funny!) examples of the challenges that translators face within different genres. Here are just a few of the ideas that he shared during the presentation. When translating a language, you have to realize that you are also moving a story into a new culture, which might have very different expectations in terms of storytelling. For example, consider the differences between beloved Japanese anime hero Anpanman and all-American comic book hero Superman. Anpanman flies around the world giving parts of his head – which is made of anpan (餡パン), a sort of Japanese red-bean jam bun – to his friends to eat so that they can fight evil together. Superman, on the other hand, is a sort of “souped-up” muscle-bound human being who flies in to dangerous situations and saves the day. When translating, you have to think about how the target audience will receive the story culturally, not just linguistically. Would Anpanman appeal to an American audience? Would Superman appeal to a Japanese audience? Maybe they would, but it would be necessary to think carefully about how to translate these stories, and how to market them, for this new audience. How do You Translate Kotatsu? Translating words that describe objects that exist in one culture but not another culture can be very challenging. For example, if a Japanese writer compares something (say…a nose) to ume-boshi (梅干し, sour pickled plum), readers who haver never been to Jaapn will struggle to identify, obviously having no idea what ume-boshi is. Stopping to explain might “pop the imaginative bubble” that fiction creates and take the reader “out of the story”. Therefore, if it is not vital to the story, it might be better to compare the nose to something else that creates a similar effect. If, however, the culturally-specific word referred to something crucial to the story, as in Alex’s example of a kotatsu ((炬燵, a low Japanese table with an electric heater underneath) which serves a murder weapon in a mystery story, extra sentences and paragraphs might need to be added to show the character “turning on” the kotatsu, “waiting for it to heat up,” etc. to convey the necessary information to a non-Japanese reader in a naturalistic manner. Translating something from Japanese to English is relatively easy. It is actually after the initial “rough” translation that the hard work starts. For example, the Japanese word 懐かしい (natsukashii) would probably be translated literally as “nostalgic.” In English, however, it would be very strange to say “She looked at the garden and felt nostalgic.” Using a scene from a mystery novel, Alex asked the students to think of other ways to demonstrate this feeling of nostalgia rather than simply translating the word literally. The students came up with a ton of great options. Alex also spoke about the challenges associated with translating jokes and song lyrics. In a joke, you need to set up a punch-line that relates to the original but is funny in the target language. In a song, you have to think about the sound of the lyrics as well as their meaning. Think You Know What Arigato Means? When Alex asked the students to translate the word arigato, students’ faces around the room ranged from amused to insulted. Several immediately shouted out “Thanks” or “Thank you very much” and Alex agreed that these were usually correct, but then asked them an interesting question: can arigato ever be translated as “I love you”? Students seemed skeptical, so he showed them an example taken from the ending of the popular video game Final Fantasy X, where translating arigato as “Thank you” would definitely have been emotionally inappropriate for the scene. Conversely, it was pointed out that in English we say “love you” in many situations that would not work in Japanese, such as saying goodbye on the phone to our moms! The teachers and students at YIS would like to thank Alex for taking the time to share his insight and expertise.